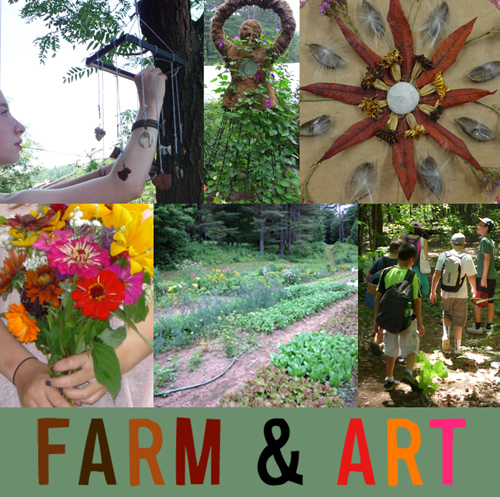 The Art Garden, Wilder Brook Farm, and Dirigo Learning Community-Based Education are collaborating to offer Farm & Art, a hands-on, nature-based program. Participants explore the gardens, fields, woods, and stream of an organic farm while learning to experience the world as an artist, a farmer, and a naturalist. Activities use art and agriculture to connect with nature. Each day includes individual and collaborative art-making, harvesting and preparing food, and exploring the farm’s varied landscape. The program culminates with a walking tour of outdoor art installations and a kid-made natural science museum. This program meets at Wilder Brook Farm in Charlemont, which is a 10 min drive from Shelburne Falls. Full payment is due one week prior to the program. Limited financial aid based on need is available upon request. Refund Policy: Deposits will be refunded in full up to 3 weeks prior to class start date. After that time, refunds will be contingent on whether the space is filled by another student. During the summer, drop-in art-making is usually available when we don’t have another program going: Tuesdays through Saturdays: 1pm – 5pm. with a family discount available. When we have a program, drop-in art-making happens AFTER the program. For example, during our Clay & Art week, drop-in art-making starts at 2pm and goes until 5pm. Occasionally, we have other events or obligations to attend to. Please call ahead to make sure we are in the studio. Our answering machine will be updated as we go along: (413)-625-2782. Thanks!